The RUF/NEK spirit member had been inadvertently dragged for a sustained period, while the wagon whizzed around the football field. The Oklahoma-Oklahoma State game lived up to the hype (and then some) on Saturday, with both clubs exceeding 45-plus points in the latest Bedlam Series clash. But that wasn't the viral moment from this frenzied event. Well, things got a little tense during the pregame activity, but for reasons not involving heated rivalries, explosive plays or any down-and-distance situations. 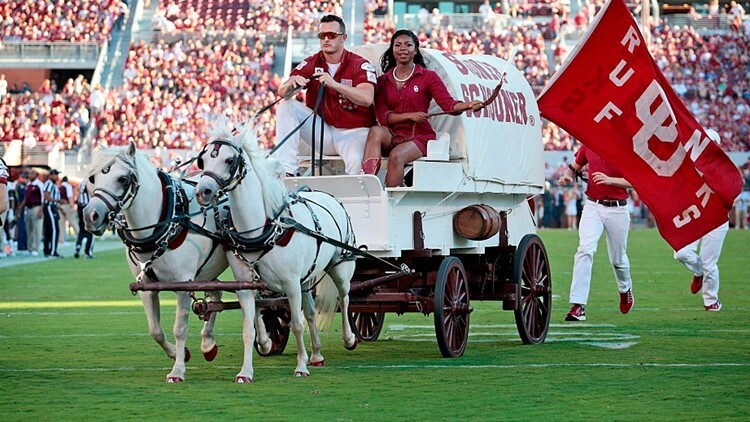 Check out this video of a RUF/NEK from the Oklahoma spirit squad accidentally getting tangled up with the famed Sooner Schooner, while the chuckwagon whizzed around the football field at a decent rate of speed. As you can see, everything turned out OK with the RUF/NEK, who successfully held on for dear life while being dragged for a sustained period. But this could have been an ugly incident, marring the most anticipated date on the calendar for die-hard Oklahoma/OSU fans. The Sooner Schooner tradition dates back to 1964 at Oklahoma. Pulled by two white ponies named Boomer and Sooner, it's viewed as a scaled-down replica of the Studebaker Conestoga wagon, the one primarily used by Oklahoma Territory settlers during the late 1880s.